Our versatile Madison chandelier centerpiece kit from ShopWildThings comes with a clear acrylic base that is 20 inches tall. 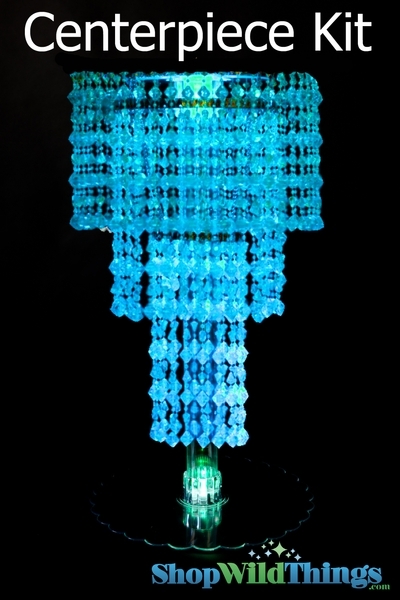 The chandelier is 10.25 inches in diameter by 12 inches in height with three tiers of faceted high-grade iridescent acrylic crystal bead strands. Beneath is an 18-inch hollow acrylic tube. This set has a 6-inch acrylic plate top and a 12-inch acrylic plate base. We use the word versatile to describe this elegant crystal acrylic chandelier special event tabletop set because you can also separate the pieces to hang the chandelier. 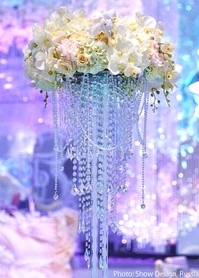 As a centerpiece, fill the hollow tube with our water pearls for dramatic effect. Create an internal glow that will also allow the crystal facets to reflect the light by using our submersible LED lighting. Add LED light discs to the flat top for extra sparkle. 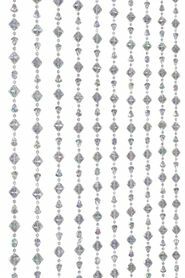 Shop our coordinating beaded curtains, backdrops and acrylic bead strands. 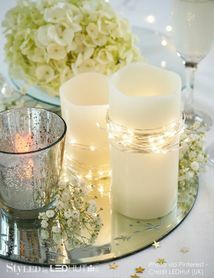 Consult our in-house experts for any assistance to help you design the perfect wedding reception, stage set or gala. We've been serving major movie studios, top event planners, wedding designers, five-star restaurants, premium retail display designers and individual customers for more than 20 years. Read our glowing customer testimonials. Trust our expertise.